This is a fan-edit of Christopher Nolan’s “Insomnia” told in reverse chronological order like his previous film “Memento”. 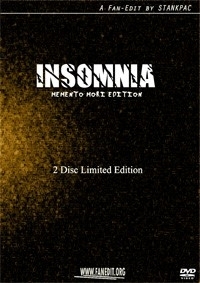 It is meant to be more of a companion disc like the “Memento” 2-disc limited edition, where in this case the original film is the first disc told in chronological order and the second disc is to have this special version of the film told in reverse. 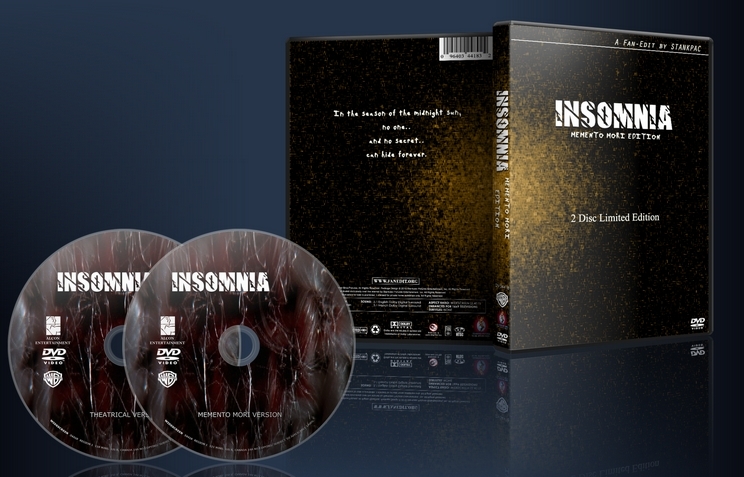 Now just slap on the new disc art, put it in a double dvd case and you have yourself an “Insomnia” 2-disc limited edition. The intention for any fan-edit that I am currently working on is quite simply to follow the simple moto “Less is more”. If it does not fit or disrupts the flow of the movie and you can edit it out without ruining story and continuity, then it has got to go. No questions asked! Synopsis Now see the movie thru Will Dormer’s (Al Pacino) eyes as he tries not to let the long sunny Alaskan days get to him while figuring out a serial killer’s mind. However, an unspeakable act starts to creep into his guilty conscious challenging his sanity that he might not be able to come back from. Director Christopher Nolan (Memento) crafts another jolting psychological thriller to remember, guiding Academy Award winners Al Pacino, Robin Williams and Hilary Swank in Insomnia. In the season of the midnight sun, no one – and no secret – can hide forever. I took the idea of Christopher Nolan’s film “Memento”, where instead of telling the story in the more traditional linear way, he told it in a reverse chronological order to let the audience figure it out along with the main character. I figured the same concept would work great with “Insomnia”. I must say I think it does. As far as the minor discrepency in runtime, I had to add in the lead in scenes from all the “reverse chronological order” sequences (color) in order for the audience to know what sequence goes next. That adds minutes to the overall runtime, so theoretically that is the only thing added to make this edit work properly. - Cut: After the title credits, removed the frames of Dormer cleaning the blood from his cuff. Not needed because now it opens up with the end of the movie moving in reverse. I cleaned up the sequence up the best I could, considering it is not suppose to go backwards. - Add: Now all the chronological sequences have been re-colored in black & white and the reverse chronological sequences are in color. When going from color to black & white it will fade in and then fade out, kinda like an “eye blink”. Very similar in style like the movie Memento! - Add: Anytime in the black & white sequences that Dormer has a vision, I have left those in color. The reasoning behind that is that those are the only things Dormer has a clear frame of mind on. - Cut: Removed a few frames of Al Pacino’s stunt double looking at the camera during the log chase, after he has fallen into the water. - Cut: Removed the last few frames right before he attends Kay’s memorium. Now movie ends with what looks like a somewhat cool looking shot of Dormer sitting at the edge of the bed contemplating. That Dormer not sleeping is going to catch up with him. I had been hesitant to watch this fanedit as I love Insomnia - I’ve watched it probably as many times as I’ve watched Memento - and I didn’t think the Mementomix aspect of this edit would work. So I viewed as Stankpak intended, an alternate cut as a bonus on Disc 2. Doing so made me enjoy it more than if I viewed it as a theatrical film in its own right. The narrative is a mess and the non-chronological timeline doesn’t work, it could have worked but it felt slapped together. Others have mentioned editing flaws in the transitions and I dig that Memento had a lot of abrupt cutting and overuse of fades but some of the work here was sloppy. All that being said I was still able to enjoy watching this. It made me think about the movie and analyze the little things more. Sorry bro. I watched this but it just didn’t work for me. As mentioned above the transitions were a little rough. Video and audio quality were good though. More importantly, I just didn’t buy into the editing decision to break the continuity of this movie, which is the crux of the edit. It made the story very difficult to follow for anyone not already very familiar with the movie, and there was no payoff at the end when the two timelines meet. In Memento and Jorge’s Blue Skies on Mars, it works because it serves the story and there is a payoff. In this and Jorge’s Dark Knight it doesn’t work for me. I don’t like being confused solely for the sake of being confused. One thing this edit did do for me is remind me just how good and under-appreciated this Chris Nolan movie is. Outstanding Al Pacino performance. I can’t add much more than what Tranzor said in his review: great fanedit with a little problem (for me) concerning most of the transitions. They are well chosen but fade to black / fade in, both on video and sound did not look right most of the time. But it does not detract much from the entertainment of this edit which I recommend to those who liked the original. Side notes: I really liked to have the choice between english and french audio. (I watched the edit in french).Thanks for the extra work. And… I never figured until today that the name of Pacino’s character (Dormer) is sounding the same as the french word for “sleeper” (dormeur)!